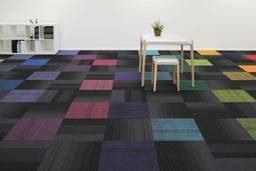 Carpet tiles provide a fashionable and practical flooring solution. They resemble sections of divided carpets and give the appearance of a whole carpet, while providing the flexibility needed for easy fitting. Carpet tiles have multiple benefits which include being able to slot the tiles into multiple shapes and dimensions of floor space. They can be cut and fitted as the carpeting process proceeds, and allow for the carpet-laying process to be individualized around singular tiles rather than one large, cumbersome carpet. Carpet tiles can also be easily replaced in cases of damages or spills in one specific area. This means that damage to the carpet in one small area does not mean the whole carpet needs to be replaced. Carpet tiles are also a popular DIY option for homeowners. This is because anyone can fit them without the expertise of a professional, which marks a distinct difference from the process of fitting a one-piece carpet. One-piece carpets require skill and experience to be fitted into a specifically shaped room and, as a result, are a more expensive carpeting option because of the added cost of labor. Some of the most common types of carpet-material include wool, polypropylene and nylon. Wool is a completely natural material that has multiple inherent benefits. Some of these benefits include being naturally fire-retardant and insulating. Polypropylene is another popular carpeting material that is known for having anti-bacterial properties because it doesn't’t absorb moisture and heat as much as other products Polypropylene is also a cost-effective carpeting option as the initial cost of the material is low and the product is extremely durable. Finally, nylon is a carpet material that offers the benefits of being fire-retardant and antistatic, as well as being a highly durable product that is easy to clean.